This weekend, we’re going to look ahead and try to predict each of the NHL’s individual awards. How will the Blackhawks stack up against the best in the game? We’ll begin with the Vezina Trophy. Last year, Columbus’ Sergei Bobrovsky took home the Vezina after a masterful season. On a Blue Jackets team that finished with 55 points, only a tie-breaker away from making the playoffs in the Western Conference, Bobrovsky posted a .932 save percentage, 2.00 goals against average and had four shutouts. The other nominees last year were the Rangers’ Henrik Lundqvist and the Sharks’ Antti Niemi. Chicago’s Corey Crawford split much of the regular season with Ray Emery last year, but certainly put up numbers that were good enough for consideration. He finished third in the NHL with a 1.94 goals against average – better than all three Vezina finalists – with three shutouts and a .926 save percentage. Crawford’s strong postseason (read: he should have won the Conn Smythe) pushed him into more of the league-wide spotlight. It also earned him a significant financial investment from the Blackhawks; he is the team’s goaltender moving forward without question. Now, Crawford not only has the eyes of Hockey Canada on him for a potential spot on the Olympic roster, but he’ll certainly be on the radar for Vezina consideration if he can duplicate his performance from a year ago. 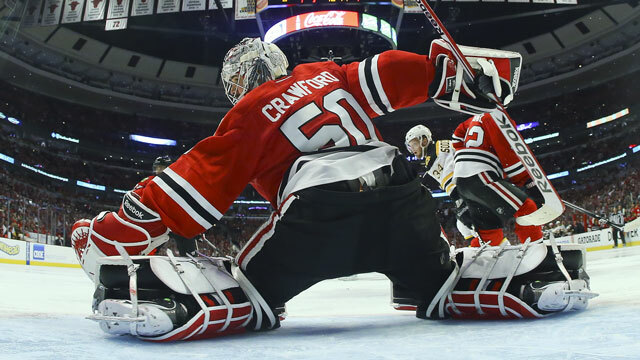 However, Crawford won’t be splitting starts with a netminder who had a magnificent season of his own in Emery. With Nikolai Khabibulin back in Chicago, and Antti Raanta in Rockford, Crawford will be asked to carry more of the load this year. Another good season from the defensemen in front of Crawford will help his numbers, and bolster his candidacy for the Vezina. But will he win it? Quick wasn’t healthy when last season started, and didn’t have a full compliment of defensemen in front of him. The Kings expect to have Willie Mitchell back this season, and the emergence of Slava Voynov and addition of Robyn Regehr make the blue line group in LA as deep as any in the league (including Chicago). My money is on Schneider NJ, and Quick L.A.
Raanta had a nice debut (pre-season- Hogs)… lost 2-1 in 10 Round shootout!!! I like your pick Wall – though it might be hard if he splits time with the living legend still suiting up in NJ. ← Who Is Joakim Nordstrom?